CH Technologies is offering an E-Cigarette Aerosol Generator (ECAG) designed and manufactured by e~Aerosols’. The ECAG delivers aerosols from most available Electronic Nicotine Delivery Systems (ENDS). Designed and developed at NYU School of Medicine, the ECAG generates each aerosol using a novel, positive pressure approach that utilizes clean, dry, particle-free air as the carrier gas. All parameters governing each puff profile can be adjusted, such as, operating voltage, flow rate, and puff duration. Puff regimes are preprogrammed at the factory or can be set by the user, allowing a fast startup at the push of a button. This novel positive pressure system allows easier physicochemical characterization at the ENDS’ exhaust port and eliminates artifacts that could be introduced from negative pressure systems that utilize ambient air for the carrier gas. The ECAG was designed to accommodate most one piece disposable electronic cigarettes, in addition to the refillable tank/ clearomizer two piece versions, and sub-ohm atomizers. By providing constant power at each port, users can choose their own operating voltage for aerosol generation or choose to operate each e-cigarette with its own proprietary battery. Ohmmeters built into each channel allow the electrical resistance associated with each cartridge to be determined. 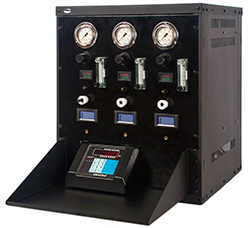 The ECAG is able to simulate all standard e-cigarette batteries and voltages, thus allowing the study of voltage effects on aerosol production and eliminating the need to use or recharge batteries during generation. Jiayuan Zhao, Jordan Nelson, Oluwabunmi Dada, Georgios Pyrgiotakis, Ilias G. Kavouras & Philip Demokritou. (Harvard School of Public Health, University of Alabama) Assessing electronic cigarette emissions: linking physico-chemical properties to product brand, e-liquid flavoring additives, operational voltage and user puffing patterns. Inhalation Toxicology, March 2018. Jiayuan Zhao, Yipei Zhang, Jennifer D. Sisler, Justine Shaffer, Stephen S. Leonard, Anna M. Morris, Yong Qian, Dhimiter Bello, Philip Demokritou. (Harvard School of Public Health, University of Massachusetts Lowell, NIOSH) Assessment of reactive oxygen species generated by electronic cigarettes using acellular and cellular approaches. Journal of Hazardous Materials, Feb. 2018. Hyun-Wook Lee, Sung-Hyun Park, Mao-wen Weng, Hsiang-Tsui Wang, William C. Huang, Herbert Lepor, Xue-Ru Wu, Lung-Chi Chen and Moon-shong Tang. (NYU School of Medicine) E-cigarette smoke damages DNA and reduces repair activity in mouse lung, heart, and bladder as well as in human lung and bladder cells. Proceedings of the National Academy of Sciences (PNAS), Jan. 2018. For more references, please visit the Publications Section.